Keen to list your Getaway? What do you get for your Moola? How do your bookings work? Question is, do you qualify? Unlike most commission-based sites we don't 'lock' you into the booking process until the deposit has been paid. From the moment you receive a booking enquiry from our site you're free to communicate with your potential guest via your preferred means, whether it be by email, phone or smoke signal. 1. You receive an email enquiry via your webpage on Budget Getaways, and reply online with a quote. The guest accepts your quote and confirms their booking. the guest has the option of paying a deposit by either credit card (into our account) or by manual EFT into your account. 2. You will receive a regular online statement detailing all enquiries received for the particular period. 3. You indicate which of these enquiries resulted in a confirmed booking and their total rand value. Commission due on these bookings is then automatically calculated and an invoice emailed to you. 4. Payment is due on receipt of invoice. 5. Voila! Your account has been settled and you're ready to start the new month on a clean slate! What happens in the case of a booking cancellation? You will need to factor this into your own deposit refund policy, as we unfortunately cannot offer refunds once commission has been paid. This is in line with similar commission-based sites. What happens if I deliberately fail to declare a booking? The success of our unique 'honesty system' relies on trust and respect between the parties. In cases where the establishment fails to act in good fatih we reserve the right to blacklist the offending establishment from our website. May I add the commission to my rates when quoting? No. The price you quote via this this payment option must be the same as it would be for walk-in guests, as we assure our users of a 'Best Price Guarantee'. None whatsoever. We will set up your webpage at no charge. Plus, we won't charge you so-called 'admin fees' for updating your page, adding new images, etc. What if I don't convert enquiries into bookings? To remain on this option you will need to convert at least 1 in 10 enquiries - this is far lower than our general site average of around 1 in 5. Your conversion rate will be assessed every three months. How do I make the most of my enquiries? 1. We highly recommend you keep an up-to-date Budget Getaways availability calendar - this will reduce the number of redundant enquiries you receive, and will help us help you. 2. Treat every enquiry as gold, by way of quick and comprehensive follow up (by email and a friendly phone call). This will improve your booking conversion rate. 3. Actively monitor your enquiry:booking conversion rate. If you are not converting at least 1 in 5 enquiries you are likely doing something wrong. 4. Repeat the following several times when you wake up in the morning: "Every booking enquiry is sacred." "Every booking enquiry is sacred." "Every booking enquiry is sacred..."
That's correct. These will provide you with an opportunity to become familiar with the Budget Getaways system, our availability calendar and other useful features. 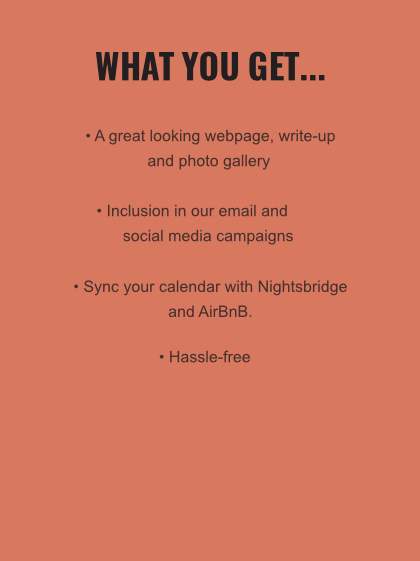 You'll likely also convert one or two of these enquiries and in the process cover the cost of your first enquiry bundle! Which enquiry bundle is best for me? Only you can decide this, though we suggest you start off small and upgrade once you've established your enquiry rate. The bigger the bundle, the lower the price per enquiry. Where will find my booking enquiry stats? These are included with every booking enquiry you receive from Budget Getaways. How do I top-up an enquiry bundle? Very easy. You will receive an email reminder and direct link to renew your subscription when your current bundle approaches expiry. Payment can be made by bank deposit, Instant EFT or credit card. These account for less than 1% of total enquiries. Wherever identified by the system, they will automatically be filtered out of your enquiry count so as not to affect your credit balance. What about enquiries for dates I've marked off as 'booked'? Our system covers this scenario - provided your Budget Getaways availability calendar is up to date. Users will not be able to submit an enquiry for dates shown as booked on your calendar. Yet again, you can stipulate your minimum stay periods for a particular month and unit - thereby preventing enquiries for periods shorter than stipulated minimum. Can I stipulate minimum guest numbers? You sure can, via a direct request to ourselves. What about enquiries that are blatant spam? If this ever happens, simply forward us a copy of the enquiry and we will credit your account. Will I be reminded when my bundle is depleted? Yes, you will receive prior warning by email and SMS. Do the enquiry bundles have an expiry date? No (unlike your local cellphone network). Can I cancel an enquiry bundle or Uncapped and get a refund? How do I make the most of my enquiry bundles? 1. It's imperative you keep an up-to-date Budget Getaways availability calendar (with detailed rates) for each of your accommodation units - this will reduce the number of redundant enquiries you receive, and will help us help you. 2. Treat every enquiry as gold, by way of quick and comprehensive follow up (by email and a friendly phone call). This will improve your booking conversion rate and save you money. 3. Actively monitor your enquiry:booking conversion rate. If you are not converting at least 1 in 5 enquiries you are very likely doing something wrong. 4. Use our online booking tools to improve your conversion rate. That's what they've been designed for. 5. Repeat the following several times when you wake up in the morning: "Every booking enquiry is sacred." "Every booking enquiry is sacred." "Every booking enquiry is sacred..."
None whatsoever. We will set up your webpage at no charge, and won't don't charge you so-called 'admin fees' for updating your page (within reason), adding new images, etc. Absolutely. If you're not happy with our performance at the end of your annual subscription, we will happily cancel your webpage on our site and refund you in full. We want Budget Getaways to work for you, and endeavour to do what it takes to achieve this. Payment is due when your webpage goes live on our site. What happens at the end of Year-one? You will receive a renewal reminder 30 days before your subscription is due to expire. At this point you can either renew with an Enquiry Bundle tailored to your needs (and determined by your Year-one enquiry rate) or change to '15% Commission'. The choice is yours. None whatsoever. We will set up your webpage at no charge. Plus, unlike other sites we don't charge so-called 'admin fees' for updating your page, adding new images, etc. Can I switch halfway through the year to another payment option? Unfortunately not. You may however do so at the end of your Year-One. Once you have received and replied online to an initial email booking enquiry from our site, you have the freedom to either use our posh online booking tools (recommended, as these will save you and your guest time and effort) or chat to your potential guest via direct email. You will receive an SMS alert notifying you of an email booking enquiry, containing a basic summary of the enquiry details. The guest receives your telephone contact details by email, but only once they have submitted an email booking enquiry. This protects you from unwanted spam and unwanted sales calls. Once the guest accepts your quote, they are given the option to settle the deposit either by EFT into your account, or by Credit Card or Instant EFT into our account (via our secure payment gateway partner, Paygate). In the latter case, the deposit (less 3% service fee) is paid on to you within 5-10 working days. *Our free 10-enquiry starter pack: Your annual subscription 'start date' only kicks in once you have received 10 free enquiries. Convert just one or two of these and you'll pay for your entire year's subscription! Please note: The annual fee is payable when your web page goes live. *Our money-back guarantee: If you are not satisfied with our performance at the end of 12 months we will happily cancel your web page and refund you in full. No questions asked! From Year Two we offer a choice between a fixed 'Uncapped' annual rate and several 'Pay-as-you-Go' email bundle options. The various options provide flexibility to select a package that best suits your particular needs and enquiry rate. Please click here for the details. We are probably the most focussed accommodation site in South Africa. Our featured getaways meet strict inclusion criteria in terms of setting, price, attention to detail and overall WOW factor. All our getaways are handpicked and represent something out of the ordinary. If a getaway doesn't cut the grade as a 'Best Getaway' we don't take it on. Simple as that. We have high street cred among our users. This reflects our unwavering belief in honest reviews and the value of guest feedback, whether positive or occasionally not so positive. Unlike most other sites, we don't believe in boring our readers. Our reviews are to the point and (hopefully) entertaining. Unlike most other sites, we don't fill our web pages with unnecessary fluff, lists and what-have-you. We strive to give our users what they are really looking for: a true sense of what the getaway is all about. We have a successful 15-year track record in the Western Cape. The vast majority of our original clients are still with us today. We hope you'll agree this says something. 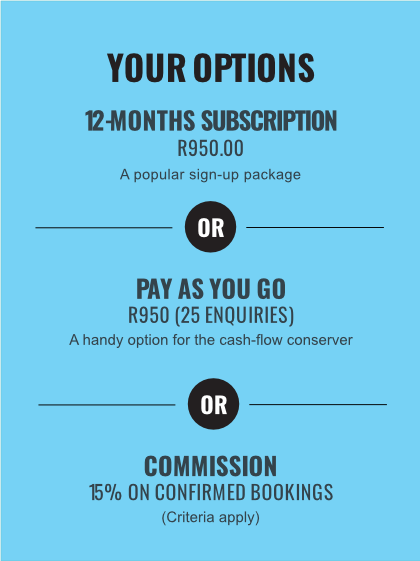 Our tailormade Pay-As-You-Go Enquiry Bundles and 12-Months Uncapped subscription options offer something for everyone. With built-in checks and balances, they also work out considerably cheaper than the standard 15% comm charged by most websties. You can expect the approximate equivalent of a 10% comm rate, assuming you convert at least 1 in 5 enquiries. Most of our getaways do better than this. ~ A personalized description of your establishment. ~ Up to 24 images. ~ A user-friendly e-mail booking enquiry facility. ~ SMS alerts with every enquiry you receive. ~ An online Availability Calendar. ~ A useful online Booking manager. ~ A Google map identifying the location of your establishment. ~ Useful web stats to track the performance of your web page. ~ Access to a large pool of prospective guests via our niche-focused newsletters. ~ Guest feedback (good and bad), as it comes in. 1. Are you owner-managed? No booking agents, please. 2. Does your establishment lie off the Cape's beaten track? That is, out of the Big Smoke. 3. Not essential, but do you offer self-catering (with or without optional meals)? 4. Is your establishment free-standing (preferably)? If yours is a granny flat, Budget Getaways probably isn't for you. 5. Do your rates fall under R500.00 per adult per night, or the equivalent if let by the unit? 6. Now for the biggie... Is your establishment something special and out of the ordinary? Unsure if you cut the grade? Please feel free to contact us for a quick assessment.